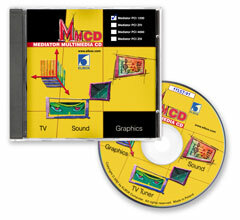 The Mediator Multimedia CD opens the World of PCI Sound, Fast Ethernet 100Mbps and TV cards for Amiga computers. New drivers are offered independently of the driver package bundled with Mediator busboards, which includes 2D and Warp3D Voodoo3 graphic drivers, Voodoo4 and Voodoo5 24-bit 2D graphic drivers, S3 ViRGE and S3 ViRGE DX 2D graphic drivers and Ethernet 10Mbps network drivers as the standard driver pack. The Mediator Multimedia CD has been prepared to provide you with the complete package of drivers for using PCI sound cards, Fast Ethernet 100Mbps cards, TV tuner cards and graphic cards in Mediator PCI busboards for Amiga 4000, Amiga 3000 and Amiga 1200 computers. For Mediator PCI 1200, the MM CD package allows using the memory window jumper set to 8MB independently of the Mediator PCI 1200 busboard series. The minimum hardware configuration is: an Amiga with a Voodoo Banshee graphic card installed in the Mediator PCI busboard. The minimum turbo card is 68030 with 8MB RAM. The recommended configuration is: an Amiga with a Voodoo3 graphic card, a Sound Blaster PCI128 sound card and a TV Tuner card installed in the Mediator PCI busboard. The recommended turbo card is the 68060 or PPC/68060 turbo card with 32MB RAM. The AHI-standard drivers for music cards provide support for Sound Blaster PCI128 cards based on ES1370, ES1371, ES1373, CT5880 and EV1938 chipsets. The complete list of the supported sound card models: see the Mediator Driver Guide. The Sound Blaster PCI128 card uses the PCI bus in the Mediator busboard as the busmaster performing DMA operations to/from the external memory. With 8- and 16-bit mono and stereo playback and 16-bit stereo recording plus user-selectable sampling rates from 5kHz to 48kHz, the Sound Blaster PCI128 produces precise audio fidelity. You can also connect 2 or 4 (optional) speakers for an engulfing 3D-surround sound experience. Two independent stereo DACs allow simultaneous playbacking of two stereo PCM channels. Mixer: Every signal is processed and mixed with a 16-bit digital audio engine for high quality. All inputs can be mixed together. It is possible to record from all the inputs simultaneously. The volume and balance can be changed independently for each input and output. Drivers for TV tuner cards provide support for cards based on the Video Decoder chipsets: Bt848A, Bt849A, Bt878A, FUSION 878A, FUSION 879A. The complete list of the supported TV tuner card models: see the Mediator Driver Guide. TV screen is rendered in the graphic card screen in a user-scalable window (PIP) or in Workbench background. The screenshots show television picture samples in the Amiga with Mediator PCI. The TV tuner cards make use of the PCI bus in the Mediator busboard as a busmaster performing DMA operations to the graphic card memory. The TV tuner card running in the Mediator PCI busboard does not burden the Amiga's processor at all. When full-screen TV image is generated, data transfer over the PCI bus between the TV tuner card and the graphic card is executed at current speed 132MB/s with average transfer rate as high as 44MB/s. The TV driver for VHI Studio is included. VHI Studio program produced by Innovative, is a video-editing and snapshot software including webcam and timelapse support and featuring (PPC-supported) highspeed MPEG compression and realtime preview facilities. Using the VHI Studio program, users of TV cards in Mediator may grab and edit snapshots and video sequences from broadcast and cable TV and any other signal sources connected to the input of the TV tuner card, for example: video cameras, TV SAT tuners, DVD players and VCR players. The Fast Ethernet driver allows using 100Mb/s cards based on RTL8139 chipsets in MEDIATOR PCI busboards. The complete list of the supported Fast Ethernet card models: see the Mediator Driver Guide. Voodoo5 5500 64MB graphic cards. The complete list of the supported graphic card models: see the Mediator Driver Guide. Full hardware 2D acceleration, resolution of up to 2048x1536x32@75. Enhanced Voodoo drivers allows use of Wrap3D drivers with Voodoo4 and Voodoo5 graphic cards. Mediator Multimedia CD Suggested Retail Price (VAT and local taxes excluded): see Product Price List.